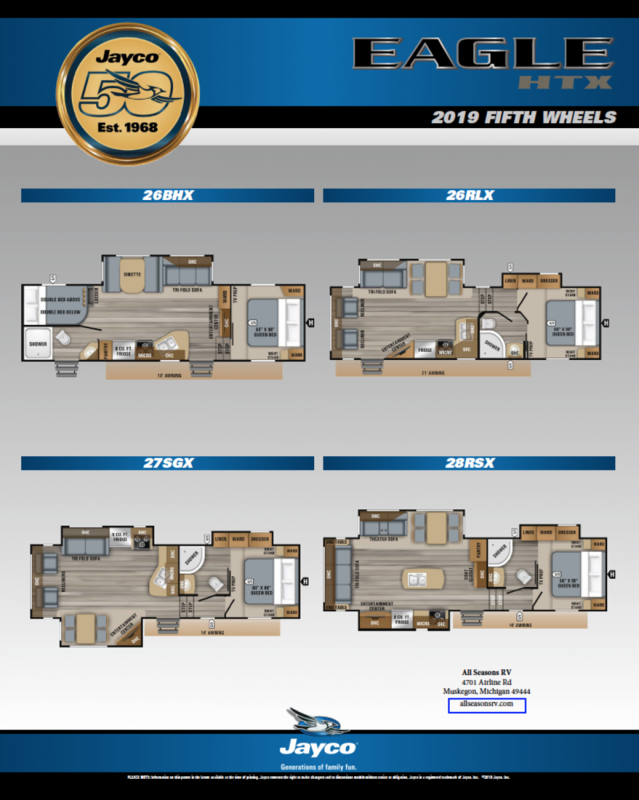 Your outdoor adventure begins here with the 2020 Jayco Eagle HTX 28RSX 5th Wheel! All Seasons RV can make your RV dreams come true! Here in Muskegon, Michigan we've been one of the nation's leading full-service RV dealerships thanks to our huge inventory and astonishingly low prices! We're #1 in customer satisfaction, so come in and explore our huge indoor showroom and find the RV that's perfect for you and your family. We're conveniently located at 4701 Airline Rd Muskegon Michigan 49444 and our friendly, knowledgeable staff are waiting to help make your RV dream a reality with great pricing and great financing! Don't live in the Muskegon? No problem! We've got personalized online and phone service and fast reliable delivery anywhere in North America! Give us a call today at 231-739-5269 and we'll make your RV dream come true in no time! You'll be amazed! This Jayco Eagle HTX 28RSX is as attractive outside as it is inside! It boasts a towable hitch weight of 1425 lbs. and GVWR of 9995 lbs! The easy to open 14' 0" patio awning provides shade and protection for all your outdoor lounging! If you're planning on traveling with friends and family, you'll want a camper that can sleep everyone. You'll be pleased to know that this cozy RV sleeps up to 4 people! You and your favorite travel buddy will receive comfort and privacy in the master bedroom, where you'll find a spacious Queen bed! There is a full bathroom inside this camper, so you'll always have somewhere to go that's close by and private! 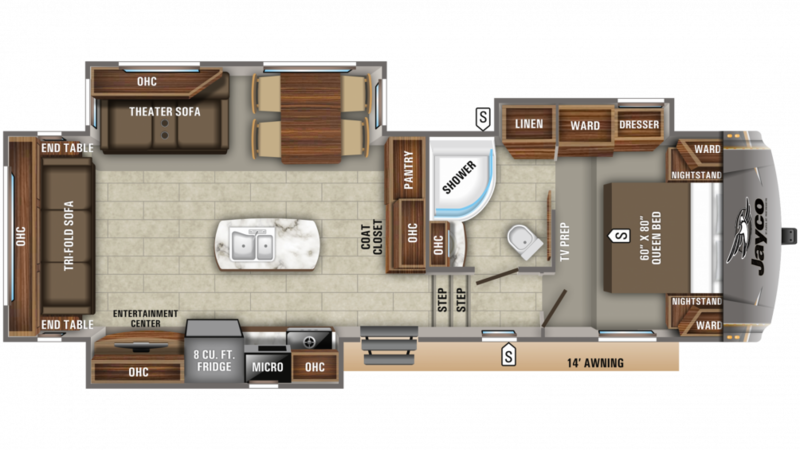 Inside you'll find a Porcelain Foot Flush toilet and a spacious shower! With 60 lbs. of LP tank capacity providing heat throughout the trailer, you'll be able to enjoy long, hot showers every morning! The 65 gallon gray water tank and the 32 gallon black water tank help you avoid dealing with waste and used water while you're having fun on the campground!